A wife, mother, singer songwriter, yogi, adventurer and truly positive soul. Katie started her entrepreneurship journey from a dream she had in 2007. This dream ignited her inner spirit and guided her to follow her dream and to bring it to life.Her venture served over 1000 youth and over 1000 community members and lead her on a road of facing fears, inner growth, and awakening. It was during this journey that Katie’s songs were born. Each time she came up against a struggle or a barrier she was gifted with a song that gave her the inner strength she needed to keep moving forward. She shared this powerful music during her workshops, camps and events. In 2018 Katie embarked on another life long dream of the professional recording of her debut album. It was in the summer of this year that the album “Believe” came into existence. Katie called her album Believe as this was the powerful energy that she needed in order to continue to step fourth and live her dream and to trust in the power within; of community, and the universe itself. At the intersection of blues, folk and soul music is where you’ll meet Katie Power. Her music can be described as down to earth storytelling filled with humor and chant-like energizing vibes. 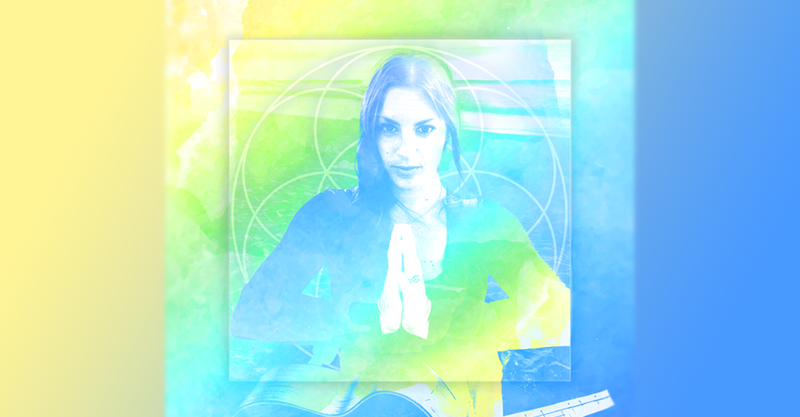 Katie’s music will send shivers down your spine, open your heart and ignite your positive energy. Her ability to reach out, engage and welcome you to share in her passion through music is one of her greatest gifts. Katie has a love for her fellow community members and life and it shows. Florence and the Machine, Edward Sharpe & The Magnetic Zeros, Rolling Stones, are some of Katie’s musical influences along with her inner spirit. Katie has over 10 years of experience with musical performance and over 20 years of experience being a guiding force for youth and the community. Katie is now offering Live Shows with her original music and tasteful lighthearted covers, as well as being available for Musical Keynotes. Her performances and circles are interactive, spontaneous, creative, fun, and packed with positive light and energy! Open mic host @ The Ship Pub, Open mic host @ Lee York Kids, Youth Open mic @ St. Mark’s Church, Jumping Bean Cafe, WanderEast Yoga Conference, Balinese Wedding Ceremony, NTV remarkable people, Out of the Fog, Earth & Sky Art Gallery (Twillingate), The House of Diamonds (Glovertown), Good Shepherd Anglican Church (Norman’s Cove), George Street United Church (St. John’s), Stepping Stones Key Note Speaker & Singer Youth Conference, Long Cove Norman’s Cove Festival Youth Concert, Wreckhouse Jazz & Blues (2 years in a row) youth concert, St. John’s Family Military Resource Centre, Pouch Cove Summer Camp, Teddy Bear Picnic St. John’s, Mo Mondays multiple performances, Women 2 Women Conference (The lantern) Key Note Speaker and performer. Katie’s goals for this debut album is to be able to provide this inspirational album for FREE to as many people in the vulnerable sector in our province as possible. Katie lost her dad in the summer of 2016 from ultimately depression that he was carrying for many years. This along with all of the work she did in the not for profit sector with her drumming circles and rising above the darkness herself; gives her great motivation to inspire those who are needing positivity, light, and hope. Katie hopes her album “Believe” can provide this for people when they are in need. A tool to access your inner strength. "Katie, thank you so much! your Dream keynote seriously woke something up inside of me, it ignited something deep within that has been laying dormant for so long, THANK YOU"
Enjoy the adventure of Katie's story where she directly responded to a dream she had, brought joy to our local communities heart and the great lessons within. Enjoy how story is related to you and your life, your potential, your impact, and your personal dreams and ambitions. A story to encourage you to follow your dream and to believe in others. Sometimes it only takes that one person to believe in you so that you can step fourth and believe in yourself. The end of this key note is Katie's signature song "Dream" where she will serenade you with her inspirational music, encouraging people to participate however they feel comfortable (eyes closed, or singing, or playing along). You participants will feel ignited, empowered, and motivated from this key note. Places where Katie has been hired; The Community Youth Network Conference, Family & Child Care Connections Conference, Stepping Stones Conference, Youth Vibrations Conference, City of St. John's Lunch & Learn, Mile 1 Stadium Staff Workshop, Women-2-Women The Lantern Women's Empowerment Conference, Iris Kirby House, Stella's Circle, Scouts Association, NLEE Conference, Multiple schools within the eastern school district, St. Andrews Staff Training, Key Assets, Waypoints, Choices For Youth, Soothe Spa...etc. See the light on the dark days.